I met a woman at a friend’s house a couple of years ago who told me that she’d hired a French nanny for her three young children so that they could learn French. I liked the idea and wished her well. But as she and her husband were both American, I secretly doubted that the experiment would bear much fruit. I ran into her again a few weeks ago and we got to talking about her child care situation. She told me that all three kids – who now range in age from three to seven – were bilingual and that she had just finished ordering them some new books on Amazon France. Wow! I thought. Impressive. And then I felt a pang of envy. Both of my kids are learning French in school. But they are a long way from bilingual. And even though the British Education Secretary has proposed that every child in the U.K. learn a foreign language from age five, that may actually be too late. 1. Bilingualism affects brain development from infancy. A fascinating article in The New York Times explains the ways in which the brains of babies in bilingual households develop differently from those raised in a mono-lingual household. Apparently, while bilingual babies take longer to distinguish phonetic sounds in either language, once they do come to recognize them, they can then hear them in both languages, while mono-lingual babies lose this facility by the time they are one. Even in the womb, one study showed that babies born to bilingual mothers not only prefer both of those languages over others — but are also able to register that the two languages are different. Wow! 2. When learning a foreign language, it’s best to start early. Younger learners still have the ability to develop near native-like pronunciation and intonation in a new language. They are also more open and curious (as a rule) to foreign peoples and cultures. There are also cognitive benefits to learning an additional language early. Bilingual children have greater neural activity and denser tissue in the areas of the brain related to memory, attention, and language than monolingual learners. These indicators are associated with long-term positive cognitive outcomes (see below). 3. But you can still learn a foreign language as an adult. While it’s true that our ability to hear and understand a second language becomes more difficult with age, the adult brain can be retrained to pick up foreign sounds more easily again. According to a study at University College London, the difficulties that adults have in learning languages are not biological, but perceptual. Thus, given the right stimuli, adult brains can overcome the habits they have developed to effectively crowd out certain sounds and learn new ones. Neat! 4. Bilingual people do better academically. Yet another reason to raise your kids speaking two (or more!) languages is that it enhances academic performance. Students who learn a foreign language out-score their non-foreign language learning peers in the verbal and – surprisingly, perhaps – math sections of standardized tests, particularly in the area of problem solving. They do better in school and are also more open to diversity, according to François Thibaut, who runs The Language Workshop for Children, which has nine schools around the East Coast of the United States. 5. Bilingual people also do better in other areas of cognitive functioning. In addition to their double vocabularies, bilingual children have stronger and more flexible cognitive abilities. Mastering two or more languages helps them solve logic problems and handle multi-tasking, skills that are often considered part of the brain’s so-called executive function. I don’t know about you, but I find this stuff fascinating. In another life I will become a linguistic anthropologist. You? 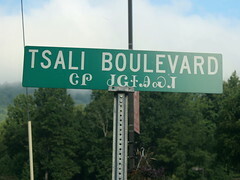 Tsali Boulevard by Caveman Chuck Coker via Flickr under a Creative Commons license. Hear, hear – to all of this! As one who began French at age 8, in the public schools in New England (an experimental program), I was able to gain fluency once I lived in France. And, to learn other languages much more easily. My own children had a parent whose native language wasn’t English (or French), but he refused to speak anything but English in our home. A terrible waste. I spoke French to both boys from the time they were little – one speaks fluently (with a near flawless accent), and has two other languages in his back pocket (besides English) – at a usable (though not fluent) level. My mother learned Japanese in her 60s and 70s! Another language opens up the world in so many ways. We should go for it – and without worrying about feeling foolish or learning more slowly (or differently) as we get older. .
Way to go — late in the day for me, but what a message to education!.